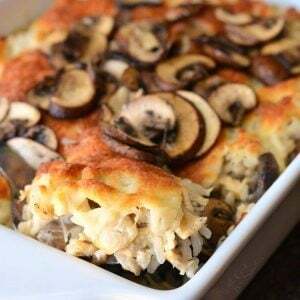 Delicious, creamy, cheesy rice casserole made with lots of mushrooms and chicken. Slice mushrooms and set them aside until ready to cook. Preheat the oven to 350 and grease a 9x9 casserole dish. Preheat a cooking pan over medium heat. Add some oil and let it heat up. Cook chicken tenders, seasoned with some garlic powder, salt, and pepper, until just done. Take out the tenders and set aside. Add mushrooms to the pan where you cooked the chicken. Season with some salt, pepper, and garlic powder and mix well. Saute mushrooms until just done as well. Take the mushrooms out of the pan. Dice cooked chicken tenders and add it to a mixing bowl. Add cooked rice and mushrooms to the bowl as well. Add 1 cup of shredded Italian cheese mix and mix well. In the same pan where you cooked chicken and mushrooms, heat up chicken stock and heavy whipping cream. Combine corn starch with a splash of chicken stock and stir until combined. Quickly stir the corn starch mixture into the stock/heavy cream mixture. Stir in salt, pepper, and thyme. Bring to simmer and take off heat. Combine the sauce with the rice mixture in the bowl. Stir well and transfer into the prepared casserole dish. Spread the casserole mixture evenly and top off with remaining cheese.